Google Mobile Search started to display short text ads in the middle of the search results page. The mobile interface mixes web search results, news, images and local businesses, but Google displays the ads after the list of regular web results. Google separates the ads using a different background, but it's weird to see the ads mixed with search results. Sergey Brin said in an interview from 2004: "One thing that's important to us is the distinction between advertising and pure search results. We make it clear when something is paid for. Our advertising is off to the side and in a couple of slots across the top. Ads are clearly marked. There's a clear, large wall between the objective search results and the ads, which have commercial influence." Obviously, it would be rather difficult to display ads off to the side and in a couple of slots across the top on a mobile phone display. Anyway, the different colour background and the boxed word "Ad" makes it quite trivial for me that I am reading an ad. Actually, the mobile ads are displayed mostly at the bottom of the page and some of them at the top. Google is probably experimenting with different layouts and positions for mobile ads, but this particular mashup was surprising. The link shows Google's search results in Opera Mini. Google tweaked the mobile interface and I can no longer link to google.com/m directly. If you use Google Mobile Search from a computer, you'll see a desktop-like interface. I guess "surprising" is in the mind of the beholder. I don't see it as "surprising." Any of the statements that Google has made before were clearly referring to the standard web, not the mobile web. All bets are off when you talk about the mobile web. 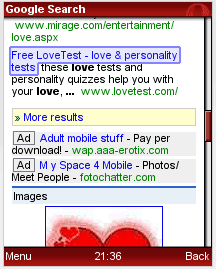 In any case, I wouldn't say that these ads are "in the results"... because there is clearly a link for "more results". It would be "surprising" to me to find the "more results" link anywhere but at the bottom of the results. Then, after this link, you see ads... which are also clearly labeled. Finally, you see a header for "image results" (so you've switched from one result-set to another result-set, which is different from Google Universal search in the regular website, where images are shown without a separating header and the multi-page links don't appear in the middle, either.) The design of the "image results" header would also classify as a clear, large wall. It's "surprising" to me that anyone would find this so "surprising". I asked about this, and as StareClips notes, I believe the ads appear after the websearch results but before other corpora such as images. So the ads are not intermixed into the websearch results; they're after the websearch results but before the other corpora are shown. So the ads are not intermixed into the websearch results; they're after the websearch results but before the other corpora are shown. But Matt, Google has been pushing the concept of "Universal Search" lately, which means that images, text, web pages, videos, etc. are all mixed in together, in the results, rather than a set of web links followed by a set of image links. Since Universal Search is the new metaphor that Google itself has been pushing, when I see web results and image results all in the same list, and ads in the middle, it really feels like a mixture of ads and organic results. Because of the Universal Search metaphor, this destroys that clear wall between sponsored and unsponsored results.